We’d love your help. Let us know what’s wrong with this preview of Set the Night on Fire by Libby Fischer Hellmann. To ask other readers questions about Set the Night on Fire, please sign up. Fascinating blend of history (Chicago 1968 Democratic convention--riots--Black Panthers--Anti War demonstrations, etc. ), mixed with a Semi-Sensuous-Juicy--Rollar-Coaster-Delight intelligent Mystery-thriller! I can't remember ever reading a historical-fiction/mystery thriller before. I like the combination! Its a little different from other types of historical fiction I usually read ---an 'enlightening'-& 'fun' experience it was!!! The characters were well developed: ( GREAT Adrenalin Rush!!!!! A fun personal note: I am 59 years old --So this book was a trip down memory lane in ways, too. Being in High School during the 1968 --- I was still busy with protected life (Cheerleading,gymnastics, fun innocent times with friends). Life changed fast once I became a Freshman at Cal. I wasn't a flower child-hippie ---I was just trying to pass my classes and discover who I was. (but EVERYBODY hurt in those days). Confusing times! 1) Maxwell Street: My dad's name was Maxwell. He died when I was 4. He was only 34. Its my favorite name! Chicago in the turbulent world of 1960’s anti-war demonstrations fused with modern day times makes for an exciting book. Dar Gantner has just been released from prison. Dar was convicted and sentenced to serve 40 years for his participation in the 1970 bombing of a department store in Chicago. Although Dar was not the only one involved in the bombing, he was the only one who was caught and prosecuted. When Dar begins to touch base with his former friends things start going downhill. It seems tha Chicago in the turbulent world of 1960’s anti-war demonstrations fused with modern day times makes for an exciting book. Dar Gantner has just been released from prison. Dar was convicted and sentenced to serve 40 years for his participation in the 1970 bombing of a department store in Chicago. Although Dar was not the only one involved in the bombing, he was the only one who was caught and prosecuted. When Dar begins to touch base with his former friends things start going downhill. It seems that there are people who don’t want Dar around and fear that he may have information that could bring disaster to at least one successful person who has his past well-hidden. Meanwhile, Lila Hilliard is in Chicago to spend Christmas with her father, Casey, and her twin brother Daniel. Tragedy struck when Lila made a short trip to the store only to return home to find that her childhood home had burned and her brother and father were killed in the fire. Lila is in danger but has no idea why anyone would want to hurt her until she finally connects with Dar who fills her in on his background and that of her mother – the mother that Lila never knew. Lila refuses to believe the story that Dar is telling but soon realizes that he is telling the truth. She joins with Dar to track down their enemies and uncover the truth behind the bombing incident of the department store in Chicago. This is no doubt the best novel that Libby Fischer Hellman has written to date and will stand out in the minds of her readers. First time reading this author and won’t be the last. I loved this book. A wonderful historical thriller that took me back to the years I was growing up and the naive idealism of the time. This book starts off with a real bang and carries the reader along. It transports us back to the sixties with a great mystery and wonderful characterisation. The incredible descriptions had me thinking I was actually involved in the story. An absolute must read thriller. Set the Night on Fire by Libby Fischer Hellmann vividly recreates that sense of not fitting into a changing world which characterized both the sixties and the present. A protagonist recently released from jail struggles to understand how technology has moved on—“appalled at how disposable capitalism had become… fascinated by phones smaller than a pack of cigarettes…” Meanwhile an intriguing young woman displays a love for numbers and patterns that immediately endears her to this reader. But how Set the Night on Fire by Libby Fischer Hellmann vividly recreates that sense of not fitting into a changing world which characterized both the sixties and the present. A protagonist recently released from jail struggles to understand how technology has moved on—“appalled at how disposable capitalism had become… fascinated by phones smaller than a pack of cigarettes…” Meanwhile an intriguing young woman displays a love for numbers and patterns that immediately endears her to this reader. But how will she recover from tragedy? Is the stranger following her a threat or a protector? And more importantly, how will she define her identity as the patterns shift and change? Moving smoothly from the 60s to the present, building convincing characters and themes, and slowly piling mystery on threat, this novel of the past is wholly relevant to the present. Thought-provoking, absorbing and hard to put down, I really enjoyed this novel. Disclosure: I heard it was on a deal and I offer my honest review. This is a truly mediocre book, the story is predictable, totally not original and with serious issues of plausibility. One can easily spot the whodunnit at a third of the story and you see coming well in advance even what is supposed to be the last twist, the grand final surprise....what the hell! On paper, the novel had many elements which make what a good book is for me, such as the coming of age theme, some mystery, a touch of political intrigue; unfortunately all this is treated in a very sup This is a truly mediocre book, the story is predictable, totally not original and with serious issues of plausibility. One can easily spot the whodunnit at a third of the story and you see coming well in advance even what is supposed to be the last twist, the grand final surprise....what the hell! Very fast read! Story really grabs you and you do not want to put it down. Most people have some ideas about the ‘60s in general: Vietnam, the protests, the “hippies.” But what about the ‘60s in Chicago? What about the ‘60s in Chicago through the eyes of the young men and women who wanted to better the world? Libby Fischer Hellmann uses her latest thriller, Set the Night on Fire, to transport her readers to a topsy-turvy time in the city’s (and country’s) history, where idealism was everything. Until it wasn’t. But it wouldn’t be a thriller without some mystery, of course. The book opens in “Part One: The Present” with one of the main characters, Dar Gantner, meeting with Rain – a friend? A foe? – in present-day Chicago to talk about “Alix’s brother,” and “Teddy,” “Casey,” and “Payton” – more friends? More foes? – as well as a mysterious package, the Convention of ’68, and, well, death. Presumably, Dar has just gotten out of jail. And it sounds like something fishy is going on. And that’s just chapter 1. Hellmann takes the reader through at least three more chapters (don’t worry – they’re short) where we follow Dar and Rain around and watch/listen to them do things we don’t quite understand while they introduce us to more characters we don’t find out much about. Typically, I’m not a fan of books that seemingly start in the middle of all the action, but Hellmann’s technique really works here. The reader learns just enough to become intrigued – but not annoyed or frustrated. Actually, I found myself hurrying along to the next chapter so I could “discover” exactly what was going on. Chapter 5 is when it all starts to come together, and we get to the meat of the novel – the tie binding all of these people. Another protagonist, Lila Hilliard, has just lost her father, Casey Hilliard, and her twin brother in an awful house fire. As Lila swifts through Casey’s life, trying to square things away with his business and personal belongings, she finds a photo of him with five other people (unbeknownst to her, they are Dar, Rain, Alix, Teddy, and Payton), and she recognizes one of the women as her mother, who died when Lila and her brother were born. When Lila’s curiosity is triggered, and she digs deeper, she begins to realize that her father had secrets – and, consequently, now her own life may be in danger. “Part Two: 1968–1970” is where Hellmann delves into the Chicago ‘60s scene and gives the reader a taste of what it was like to be at the forefront of trying to produce change. I know nothing of Chicago in the ‘60s, so it was fascinating to learn about the area – both architecturally and culturally. I must admit, I was a little disappointed that I didn’t really have any of those “Oh I’ve been there!” or “I recognize that!” moments, but as a child of the late ‘70s/early ‘80s, I suppose I shouldn’t be too surprised. I won’t divulge much – because this book is best when read for oneself, following all of Hellmann’s twists, turns, and surprises. But we get to know the six people (Casey, Dar, Rain, Alix, Teddy, and Payton) who come together for a common cause and watch them slowly drift into different directions – some more extreme than others. And by the time the reader reaches “Part Three: The Present,” we know how they all end up fitting into the life of Lila Hilliard – and the danger she’s in – in the present. Set the Night on Fire is Hellmann’s seventh crime fiction novel (check out her website (http://www.libbyhellmann.com/) for more information on Hellmann and her work). I haven’t read any of the others, but if they are as engaging and suspenseful as this one, I’ll be adding them to my “to read” list very soon! It isn’t possible to explain to people who weren’t young on November 22, 1963 how much the world changed with the assassination of John Fitzgerald Kennedy. Libby Fischer Hellmann centers SET THE NIGHT ON FIRE on six people who came together to try to change the path they saw as destroying the United States. JFK, Martin Luther King, Jr, and Robert Kennedy whipped up enthusiasm in young adults by convincing them they could change the world. When MLK and RFK were assassinated, there wasn’t anyone to step into their shoes and keep the the dreams alive. Instead, the focus was the war in Vietnam and the “military-industrial complex.” Dar, Rain, Alix, Teddy, Casey, and Peyton shared a vision until they didn’t and for two of the group, their association would lead to tragedy. The author bookends the story of the group in the sixties with their separate stories forty years later. SET THE NIGHT ON FIRE is a page-turner. From the first paragraph the reader is drawn in, wanting to know everything there is to know about the characters. How did they come to live together? How did they drift so far apart? The author creates the atmosphere of the sixties perfectly. The chaos and damage done at the 1968 Democratic convention led to the election of Richard Nixon and Richard Nixon led to Watergate and the greatest threat to the judicial system faced by this country. But the reality of the characters in the book is as foreign to me as it would be to my children. My kids were appalled that I had not been at Woodstock. I explained I was working two jobs to pay my tuition. I had to confess that all my friends were equally boring. The characters represent that small group of twenty somethings that had the time, and the courage, to embark on a campaign to turn the United States inside out. What makes the book so very good is that the author doesn’t allow the characters to stay forever young. Growing old and growing up are not necessarily the same thing but for most, like Dar, Rain, Alix, Teddy, Casey, and Peyton, growing up meant taking on the responsibilities against which they had raged. The book exists perfectly in both time frames because the choices made by the characters when they were just entering into adulthood, come back to haunt them and hunt them. The sins of the fathers, and the mothers, bring wrath down upon the succeeding generations. Every so often a novel comes along that connects with the reader in such a visceral way that it is like a punch in the stomach. This is such a story. If you lived through the nineteen-sixties and your memory is reasonably intact, or you learned even a small amount about those turbulent times, you will connect with this story. On one level this is the story of Lila Hilliard. Forty-some years after a particular series of spectacular and dangerous events in Chicago that revolved around a nasty far-off war and a political convention, a mysterious fire has robbed her of the only family she has ever known. At about the same time, a man named Dar Gantner, just released from prison, returns to Chicago from prison to reconnect with a few of his former companions from the same era. One, a woman named Rain, tells Dar that another of their mutual friends has just met with an odd fatal accident. It is clear in their conversation that Rain doesn’t entirely believe that it was an accident. From that moment on it becomes apparent that dark and unknown forces are at work. But why? Who are these people we meet at the beginning of the book, who targets them and why? Through a series of small and then progressively longer flashbacks we are transported to a time when young people believed the rhetoric, that they could indeed change the outcomes of momentous happenings, that they could affect the course of the most powerful nation in the world. Some of those players, whatever they believed, moved on to build calm and substantial lives of commerce, and politics, and contemplative existences. They don’t want to relive any part of that time. Most readers alive today will have memories of the Chicago convention of 1968, or of the riots and will begin again to remember the emotions of the time. And even if not, the measured, artful, portioning out of connections, of information, will bring those emotions to the surface. On another level, this is the telling of the great events of the late sixties, the crimes and the abuses and the trails that descended from them, not from the newspaper headlines or the televised reports, but through the eyes and hearts of some of the young people at the center of the conflicts. But this is no polemic, nor is it an attempt to change the record. What the author has done is produce a cracking good thriller that grips a reader by the throat and doesn’t let go until the final pages. One after another the revelations keep coming, and as the central characters struggle to stay alive long enough to solve their mysteries, the author maintains our interest in the love story, the history and the dynamics of the times. It doesn’t matter your political beliefs, then, or now; the characters and their trials will reach off the pages of this fine novel and touch you in ways that are basic to our existence as human beings. This is a fine, fine novel that well deserves the accolades it will surely receive. The late 60s were a turbulent time in America’s history, with groups such as the Black Panthers and SDS being born to address the social issues of the time. The situation explodes at the 1968 Democratic Convention in Chicago, with riots on the streets. Many social activists and idealistic students flocked to Chicago to try to change the world. As the riots rages, six young people meet in the streets and decide to share an apartment as they pursue their individual agendas. Among them are Dar Gantner, who assumes a leadership role and who becomes the lover of Alix Kerr, daughter of a prominent businessman; Payton who moves into more extreme solutions along with Teddy Markham, who later becomes a presidential candidate; an artist named Rain, and Casey Hilliard, who is in love with Alix. It’s forty years later, and various members of the sextet have died suspiciously. The latest incident involves Casey Hilliard and his son, Danny, who die in a house fire. Danny’s twin sister, Lila, was not at home at the time; but her life has also been threatened. Due to past connections, Dar feels compelled to look out for her; when they finally meet, they join forces to fight the evil that has its roots in the past. Lila has another reason for working with Dar. She has never known her mother, and her father never spoke of her. Through her own efforts, she finds out about the 60s commune and is hoping that Dar can provide her with the information that she so desperately seeks. The narrative transitions from the present day to the late 60s and back again. Hellmann has done a superlative job with the 60s Chicago setting. I felt as though I had entered a time machine and been transported back. She makes the entire time come alive, recreating a historical time in perfect detail. That entire section of the narrative was fascinating to me, as it was so well done. The segments dealing with the present were less successful. In order to create suspense and keep the pacing moving, there were several scenarios that just didn’t feel credible. For example, unsuccessful attempts are made on Lila’s life several times. And as the denouement unfolds, she becomes an accomplished markswoman, despite the fact that she has just learned how to shoot a weapon. I also had a little trouble getting into the book—characters were introduced without being placed into context. But once the narrative moved on, I found that the six main characters were very well developed, each memorable in their own unique way. Despite the flaws that I’ve mentioned, I found SET THE NIGHT ON FIRE to be a book that I quite enjoyed due to the excellent rendition of Chicago in the late 60s. As a college student during that time, it brought back a flood of memories of a turbulent time that led to lasting changes in American life. For Lila Hilliard it’s too late to leave things alone. Not after her father and brother are killed in a house fire that would have also taken her life had she not stepped out to run a quick errand and, shortly thereafter, a mysterious man on a motorcycle takes a few shots at her as she’s walking home one evening. That attack is foiled by another unknown man, who again rescues Lila when a subsequent attempt to kill her by blowing up her apartment is made. Lila knows she’s been targeted by someone, and that she also has a guardian angel looking out for her. What she doesn’t know is who, or why. When she goes digging for the truth she discovers her guardian angel, Dar Gantner, is a recent parolee who knew her father more than 40 years ago in Chicago during the turbulent anti-war student protests of the late 60’s. Gantner tells Lila a story that reveals a side of her parents she never knew existed, causing her to realize they were not the people she thought they were. At one point they lived in a collective household along with four other friends, all of them full of piss and vinegar, ready to take on the system and change the world. Unfortunately one of the collective’s members was a bit too radical in his beliefs, and a protest gone wrong left one of the group dead, Gantner in jail, and the others scattered to the four corners determined to keep the secrets of the past. Thought long since dead and buried, those secrets have found new life in ways that will change Lila’s forever. In Set the Night on Fire author Libby Fischer Hellmann has created an intense, atmospheric thriller, a portion of which is set against the backdrop of some truly historic events in American history. The anti-war protests of the 60’s were an integral part of a series of cultural touchstones that define a generation, yet which grow more removed from the collective consciousness with every passing year. As someone not quite old enough to remember those events firsthand, I found Hellmann’s descriptions to be wonderfully vivid, conjuring up a picture so crystal clear I almost felt as though I were there. Dar Gantner, Alix Kerr, Julie Bergman, Casey Hilliard, Teddy Markham, and Payton meet accidentally in Chicago the summer of the 1968 Democratic convention. They're all to varying degrees involved in the protests, and in the aftermath they become housemates and friends, becom Forty years ago, idealistic young Americans wanted to end the Vietnam War, make a more just society, change the world. Forty years later, a secret involving one group of those once-young people is causing a string of murders. It's the year 1968. The United States of America. Civil Rights leader, Martin Luther King, Jr. has been assassinated in April in Memphis. U.S. Senator Robert F. Kennedy has been killed in June in Los Angeles. And in August the Chicago Seven have been arrested for conspiracy to incite a riot at the Democratic National Convention. Libby Fischer Hellmann sets her genre-defying novel in the Chicago of 1968...and forty years later. The novel is a historical thriller, a "politically-charged whodunit," It's the year 1968. The United States of America. Civil Rights leader, Martin Luther King, Jr. has been assassinated in April in Memphis. U.S. Senator Robert F. Kennedy has been killed in June in Los Angeles. And in August the Chicago Seven have been arrested for conspiracy to incite a riot at the Democratic National Convention. Libby Fischer Hellmann sets her genre-defying novel in the Chicago of 1968...and forty years later. The novel is a historical thriller, a "politically-charged whodunit," a hippie love story and/or a fictional classic about the anti-war protestors of The Sixties. Her characters are six college drop-outs: Dar, Casey, Alix, Rain, Payton and Teddie. Gar is the leader of the group. He's the son of a blue-collar auto worker and a Michigan MOBE - Mobilization to End the War. He has helped organize busloads of students to drive from Ann Arbor to the Democratic National Convention in Chicago to protest the war in Vietnam. Hellmann begins her novel, Part One: The Present, with co-narrators. Lila Hilliard is in Chicago to celebrate the Christmas holiday with her father, Casey, and her twin brother. Dar Gartner is in Chicago having been released from prison after forty years of incarceration. Lila has been shopping for tree lights and returns to find her father and brother have perished in a devastating house fire. Dar attempts to call old friends and finds himself on the run. Part Two: 1968-70 introduces Gar's friends who stayed around Chicago after the riots. Alix, the daughter of a wealthy department store owner. Rain, with her round glasses, platinum hair and enthusiasm. Casey and Teddie, who were students at Michigan with Gar. Payton, who spouts propaganda with every breath, from a campus in Iowa. We visit Chicago sights - The Coliseum, Grant Park, the Maxwell Street markets, the commune in Old Town. We hear of a department store bombing. A member of the commune is killed. Part Three: The Present redeems the past and solves the mysteries. Lila learns about her mother. Dar finds answers to unresolved questions. Lila Hilliard has reluctantly come home for Christmas; her father is recovering from hip surgery and needs her, but she doesn’t really get along with her twin brother Danny any longer. A quick errand to get some new lights for the Christmas tree takes longer than she expected, and when she returns the house is in flames. Both her father and brother perish in the inferno. The official verdict is a faulty string of lights, but Lila was certain she had unplugged the tree before leaving the house. A few days later a stranger on a motorcycle shoots at her, missing only because a good Samaritan intervenes. Clearly someone is after her and her family. But why? Before Lila (or the reader) can get an answer to this present day mystery, we need some back story. And so Hellmann drops the suspense to take us back to 1968-1970 Chicago and a group of college drop-outs who are passionate about challenging the establishment, ending the war in Vietnam, and changing society. Hellmann is a good writer. The first and third part of this book prove that she can craft a suspenseful plot with sufficient twists and turns to keep the reader’s interest (though I had figured out the bad guys much earlier than our heroine and hero, who seemed ridiculously clueless and naïve in their actions). The main problem I had with this book, however, is the long detour back in time that Hellmann took in the Part Two (Chapters 22 through 44) in order to set up the great conspiracy. This took far too long to explain the important connections and motives, and completely disrupted the flow of the central plot. A Thrilling Sixties Trip and More! Libby Fischer Hellmann's first stand-alone novel, Set the Night on Fire was a great find. The novel set in the sixties and present is part historical, part thriller and part family drama. Ms Hellmann portrayed the 1960's with its often naïve anti-Viet Nam War protestations perfectly. Our main character is Lila, and when her father and brother are killed in a house fire...it sets off an horrendous chain of events that finds Lila on the run from an unknown killer. L A Thrilling Sixties Trip and More! The plot is very well developed and I found myself looking forward to each instalment eagerly. Ms Hellmann has some wonderful characters; well-fleshed out and perfectly believable, even down to the perpetrator(s) trying to kill her. And it is these characters that bring the whole story alive. Add to that Ms Hellmann's vivid and colourful Chicago pulsating through the text and you have a wonderful thriller. The pace is great - never letting up, and I paticularly enjoyed the final thrilling couple of chapters. I have to say, if you're looking for a novel with finely drawn characters, a good sense of time and plenty of action you could do no better. Authentic, well-crafted and a great adrenalin rush. A perfect read for losing yourself in. This story was a mystery thriller that was well-executed. The deeper I read the more interested I became. The key players are introduced in the beginning with a mystery obviously clouding over them all. A mystery that happened in the late 1960s and though decades have passed, not everyone has forgotten. At the center is Lila Hilliard and Dar Gantner, a convict recently released. When Lila faces a series of unfortunate and tragic events; a house fire that kills her father and brother, a personal This story was a mystery thriller that was well-executed. The deeper I read the more interested I became. The key players are introduced in the beginning with a mystery obviously clouding over them all. A mystery that happened in the late 1960s and though decades have passed, not everyone has forgotten. At the center is Lila Hilliard and Dar Gantner, a convict recently released. When Lila faces a series of unfortunate and tragic events; a house fire that kills her father and brother, a personal attack and the appearance of Dar in her life, she knows it's no coincidence. She has to figure out who her enemies and friends are and piece together the past and its significance to her. Dar is a man who has a wrong to right but as an ex-convict it's not going to be easy. He has unfinished business with the past but it seems someone is willing to kill to keep the past hidden. It is not until the story goes back to the rebellious Sixties that the pieces start falling into place and we discover what the mystery is. The sequence of past events all lead into the present, where more unexpected twists and turns are introduced. For Dar, it's the chance to become a better man. He's longer an idealist youth bent on being a force of change in Chicago, he's an older realistic man facing the chance to start fresh. 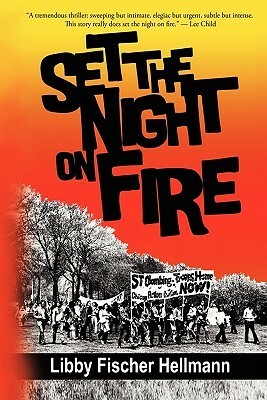 Set The Night on Fire, by Libby Fischer Hellman, a-minus, Narrated by Diane Pirone Gelman, produced by Libby Fischer Hellman, Downloaded from audible.com. brother trapped inside and burned to death. We also see a man, Dar, released from prison. He has served a 40-year sentence for murder, serving time since 1968, with the murders unplanned, but Set The Night on Fire, by Libby Fischer Hellman, a-minus, Narrated by Diane Pirone Gelman, produced by Libby Fischer Hellman, Downloaded from audible.com. brother trapped inside and burned to death. We also see a man, Dar, released from prison. He has served a 40-year sentence for murder, serving time since 1968, with the murders unplanned, but occurring because people, including the store owner’s daughter, were at the wrong place at the wrong time. Lila was told by her father that her mother had died in childbirth and that is why she and her twin brother were raised by her father alone. But after Lila is almost killed twice, and after she learns about other killings connected with 1968, she knows she will have to investigate to save her own life. She learns about six people, including her mother and father, who lived in an apartment in Chicago in 1968 during the time of the Democratic convention and for two years after that time. Dar and Alexandra were a couple, Casey and Rain were there as well, and then two more rabid revolutionary types lived in the apartment. But as time went on, they began to distrust each other, as did everyone else during that time. Were some people FBI informants? This is a book where we revisit again the 1968 through 1970 time in Chicago. This is a historical novel plus a thriller. I have now read three of Hellman’s books, and this is by far the best one of the three. Set the night on fire is a fast pace suspenseful thriller that’s a very entertaining read. Dar Gantner is an ex con that was convicted of an explosion of a department store 40 years ago and was recently released from prison. The people that he had associated with before his imprisonment, were mysteriously dying after or before his release. One of his friends that was recently killed was named Casey. He and his son Daniel was killed in a house fire. Daniel’s sister Lila would have been in the hous Set the night on fire is a fast pace suspenseful thriller that’s a very entertaining read. One of his friends that was recently killed was named Casey. He and his son Daniel was killed in a house fire. Daniel’s sister Lila would have been in the house too , but wasn’t there when the fire started because of an errand she had to make. A) whose behind the recent deaths of his former friends and B)Whose trying to kill Lila. Part of the back story was interesting though it dragged just a little , but at least it gave an insight to Dar’s character. The story flowed nicely and you definitely liked the main characters and even some of the supporting characters and the ones you wanted to despise you definitely despised. If you ever, get the chance to read ”Set the night on fire”, do so you’ll definitely enjoy the book. I was intrigued by the events that happened to Lila. I was surprised that she did not have a closer bond to her twin. I became attached to Lila and Dar and had to keep reading to see what would happen next in the story. I like the realism of turning to the computer when we have a question. I realized how much we turn to the internet for information and how readily available it is through the public library. I wonder how the events of the 60's would have played out if there was the access to information through social media that we have today. For me, a good sign of great book is that the story has stayed with me days after I have finished the book! Recommends it for: everyone, especially those who loved or lived the Sixties! This is one of the best books I’ve read all year! Dar Gantner spent 40 years in prison and just got released. He looks up old friends and it appears he’s gotten someone upset about it. Lila Hilliard loses her brother and father in an accidental fire, but was it an accident? Rain has someone run her off the road and dies when her car catches fire, another accident? Dar has had someone break in a search his place, and barely escapes. Lila’s life is threatened, when she is mugged...coincidence? She starts trying to figure out what is going on, Dar has a good idea what is going on. It all goes back 40 years to before he was sent to prison. What does this have to do with Lila? This is a thriller, love story, trip to the volatile Sixties, and a great mystery. The characters are well developed and likeable. The action is non-stop, and the suspense is always there. I had a hard time putting this one down. I have read most of Libby’s other books and this is far and away her best yet! I loved the story, loved the trip back to the Sixties, and loved characters. This one will be on my Best of 2010 List for sure. I highly recommend this book. Get it, you won’t be disappointed! This will be out December 2nd. I was looking forward to reading Set the Night on Fire by Libby Fischer Hellmann, which takes place in Chicago during both the present and in the past - the 1960s, which was a tumultuous time, especially for teens and young adults trying to understand the world around them and how they fit into it, or what they need to support to make change happen. The book is organized into 3 sections, with the first section providing the realistic fiction and suspense, the second section provided the crux of I was looking forward to reading Set the Night on Fire by Libby Fischer Hellmann, which takes place in Chicago during both the present and in the past - the 1960s, which was a tumultuous time, especially for teens and young adults trying to understand the world around them and how they fit into it, or what they need to support to make change happen. The book is organized into 3 sections, with the first section providing the realistic fiction and suspense, the second section provided the crux of the story and the historical fiction, which told the story of Chicago in the 1960s - the politicians, the activists, and the climate of tension. The third section returned to the plot of section one, and made everything happen quickly with a Hollywood ending. This was the weakest part of the book, the plot was exaggerated with an additional plot line, which didn't seem necessary; it actually seemed to be out of place, and made the book longer than it needed to be. Lila Hillard had left the family home to get some new Christmas lights. On her way back her house was on fire and both he father and brother had perish in the fire. Lila is devastated and started to look into her fathers files. She spots a picture of six people including her father and mother. Lila starts to track each person down to find out anything about her mother. Dar Ganther is out looking for his daughter the child he had given up to one of his closets friends. He had to find his daughter before the killer does. Why is Lila being hunted down from something that has to do with Dar's past? Can both Lila and Dar find the culprit before its too late? This book brought memories, as I live about 90 miles from Chicago and was a in college at the time of the Democratic Convention in Chicago. The book is an exciting trip down memory lane. The book starts out in the present day with Dar, who has recently been released from prison for a crime he committed during the convention in Chicago. He is able to contact one of his friends that he lived with in Chicago. One of the others is already dead and the one he contacts soon dies. Then a fire in the affluent suburbs kills a third. Then the book returns to 1968 and the story behind the reason that Dar was sent to prison in the first place. Hellmann does an excellent job of presenting the background of the behind the scene conflicts without taking sides. Then the book returns to the present day and ties everything up in a very exciting finish. I've read and enjoyed several books by Libby Hellmann, and I think this is the best yet. I was 12 in '68 and was equally fascinated by and fearful of the social turbulence of that time, so I particularly loved how well she captured those tumultuous days. I thought her technique of shifting time periods worked really well as she introduced us to well-formed characters. The result is that we not only understand key players in their youth--when they believed they could change the world--but we unde I've read and enjoyed several books by Libby Hellmann, and I think this is the best yet. I was 12 in '68 and was equally fascinated by and fearful of the social turbulence of that time, so I particularly loved how well she captured those tumultuous days. I thought her technique of shifting time periods worked really well as she introduced us to well-formed characters. The result is that we not only understand key players in their youth--when they believed they could change the world--but we understand how their choices and the consequences shaped who they became. The mystery at the heart of this story is compelling--why (and who of course) is someone killing off people who had been friends in the 60s, and the suspense that builds, as the daughter of one of the women is targeted, is quite satisfying. Dar Gantner, recently released from prison, is looking up some of his old friends only to find that one has died in an 'accident', another has died in a home fire along with his son. His friend's daughter, Lila, was fortunate not to be home when the fire started. Another friend, Rain, had an unfortunate car accident after she has helped him with some information he needed. Lila tries to find some information about her mother's family when she begins to think someone is trying to kill her. Dar re Dar Gantner, recently released from prison, is looking up some of his old friends only to find that one has died in an 'accident', another has died in a home fire along with his son. His friend's daughter, Lila, was fortunate not to be home when the fire started. Another friend, Rain, had an unfortunate car accident after she has helped him with some information he needed. Lila tries to find some information about her mother's family when she begins to think someone is trying to kill her. Dar rescues her after her brother's home has been hit with a grenade. Lila is not sure if she can trust Dar after hearing he has spent the last 40 years in prison for bombing her grandfather's store. This is where the author takes us back in time to 1968 when the Democratic National Convention is being held in Chicago. Hopefully, Lila and Dar can find the answers they are looking for.